Tomahawks have been used extensively throughout history not just for hunting, but also as tools and self defense. They are lethal, yet strong and robust and can be the difference between you sleeping under a shelter or in the in a survival situation. The CRKT Chogan T-Hawk lives up to the traditional tomahawks used throughout history by incorporating a quality design and build with great looks and features. This model was designed by Ryan Johnson who has been practicing the art of making tomahawks for over 30 years and has built a very loyal fan base, especially amongst special forces troops. That alone has to tell you something about the quality of these tomahawks. 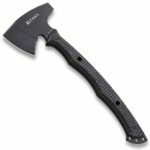 These are one hell of an axe and I would recommend them to anyone who is looking for a reliable axe to take with them camping or even for somebody in the military. You will be finding countless uses for it and wondering how you ever got by without one. The CRKT Chogan T-Hawk features a close to 3″ blade on the head of the axe but also features 2 other sharpened edges brig the total to 3 meaning you can do a whole lot with this bad boy. The axe is made from one single piece of SK5 carbon steel which delivers a super sharp edge capable of slicing through big objects such as tree limbs and other hard materials as well as having a finer edge in order to cut through the finer materials. The head also features a blunt side which allows it to be used to smash and break through a variety of materials with ease, or be used as a semi-hammer. The hardness of the steel is 54-55 meaning that this axe can really dish out some damage without being at the risk of breaking or chipping. As this is a tomahawk you would expect it to have a high quality, which is exactly what the CRKT Chogan delivers. The handle is made out of high quality glass filled nylon with a checkered finish which allows you to get a really solid grip. The grooves on the Chogan also allows you to hold it in a variety of positions really comfortably allowing you to use it in a variety of different ways in a variety of different situations. The bottom of the T-hawk also features a glass breaker which can come really handy in a variety of different situations making it the Chogan extremely useful. 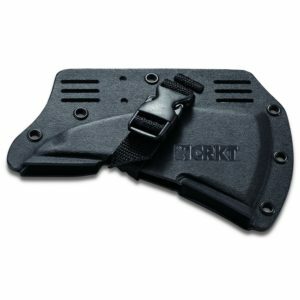 Overall, if you are in need of a T-hawk, I definitely recommend either the CRKT Chogan or the CRKT Kangee as they are both sensational T-hawks from a fabled designer. You will be getting nothing but quality from one of these. I suggest you go and check them out at your local out doors store just to make the right choice between the two. Even better, get one for someone for Christmas (Its only 10 days away! ).